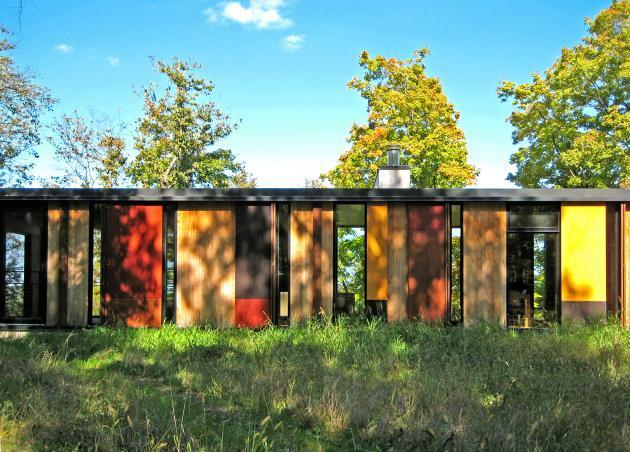 Johnsen Schmaling Architects have designed the Camouflage House in Green Lake, Wisconsin. 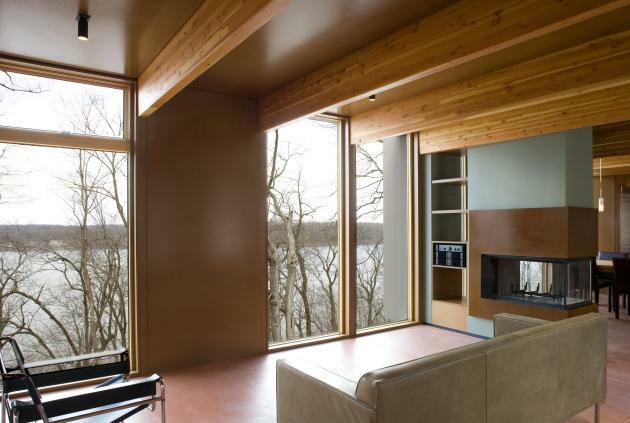 The Camouflage House sits on a steep lake bluff, its narrow, linear volume nestled into the hillside. 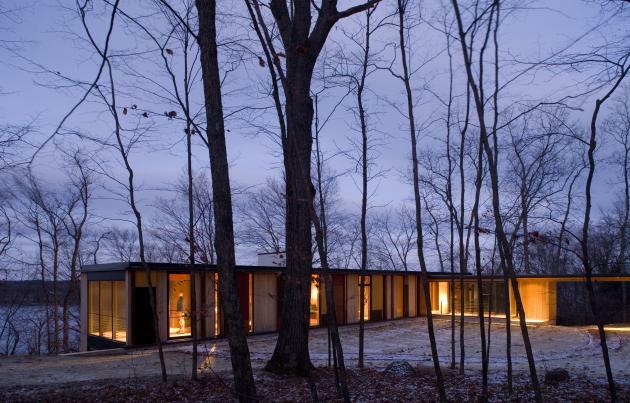 Approaching the house from the rugged access road weaving through the site’s heavily wooded plateau, the building’s faint, low-slung silhouette virtually disappears in the surrounding vegetation. 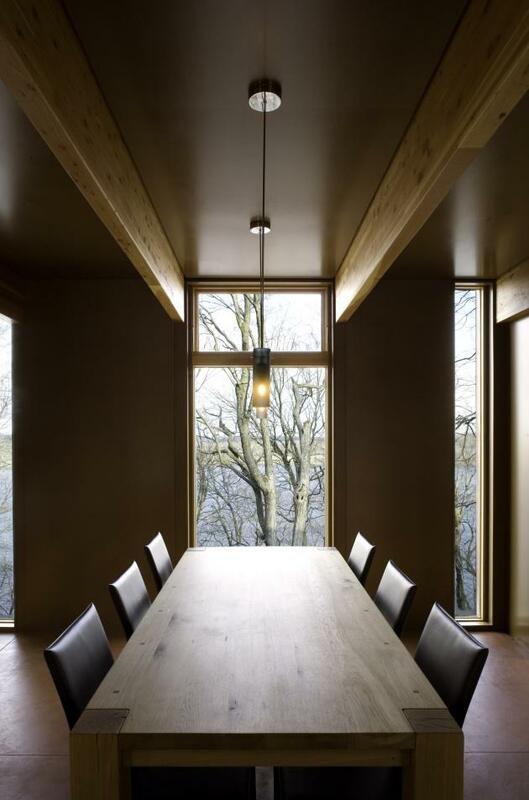 With its simple plan, restraint use of materials, and precise detailing, the house achieves an elegant clarity and a rustic warmth that nevertheless avoids bucolic sentimentality. Informed by early conceptual studies of the most striking features of the context, the house’s complex system of façade layers, contrasting the geometric discipline of the building mass, expresses its ambition to assimilate with its surroundings. Echoing the trees’ arresting verticality and the rhythmic shifts between the trunks as one moves through the site, the building skin is composed of solids and voids – wall and glass panels – whose seemingly random organization overlaps with the strict 48” base grid of the building’s exposed structural columns. 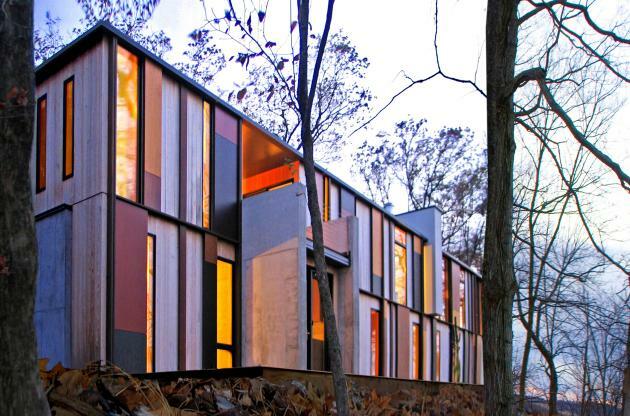 This first façade layer is clad in untreated vertical cedar and serves as the backdrop for a series of polychromatic Prodema wood veneer panels that reverberate the ever-changing hues of the surrounding deciduous trees. Over time, the cedar walls will weather to a silver-gray, while the wood veneer panels will retain their original color and pristine finish. From the small clearing of the entry court, the low roof of the open breezeway connecting house and garage leads to a linear, glazed entry foyer that penetrates the two-story, 2,700 SF bar building and terminates into a partially covered balcony with spectacular views of the lake. 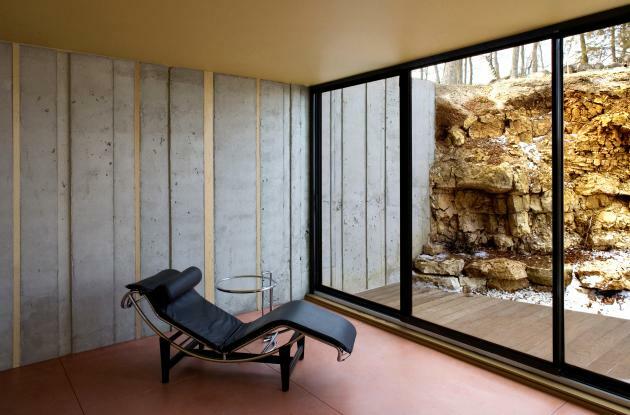 Stairs connect to the lower level, which is fully exposed on the lake side and houses all bedrooms, providing access to the zero-edge bluff terrace that stretches along the entire length of the building and to the master bedroom “grotto,” an intimate outdoor space between the western edge of the house and the site’s imposing rock formation. On the upper level, kitchen, dining and living functions occupy an open space that can extend into the adjacent spacious screen porch by retracting the large, foldable glass door system separating the two. Throughout the spring, summer, and fall, the screen porch functions as the home’s lung, taking advantage of the mild lake breezes. 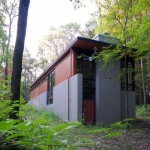 The inside of the house, while unapologetically contemporary, continues Wisconsin’s long history of lake cottage architecture, which has traditionally featured exposed timber construction, interior wood siding, combined living and dining halls centered around a fireplace, and a limited palette of natural materials. Meticulously detailed, the entire entry level of the Camouflage House is clad with clear-sealed MDF panels, held apart by reveals that accentuate the strict structural rhythm of the house and align with the exposed engineered wood beams above. Exposed integrally colored concrete floors throughout the house complement the warmth of the MDF walls, as does a three-sided CorTen steel-clad fireplace forming the focal point of the open living hall. 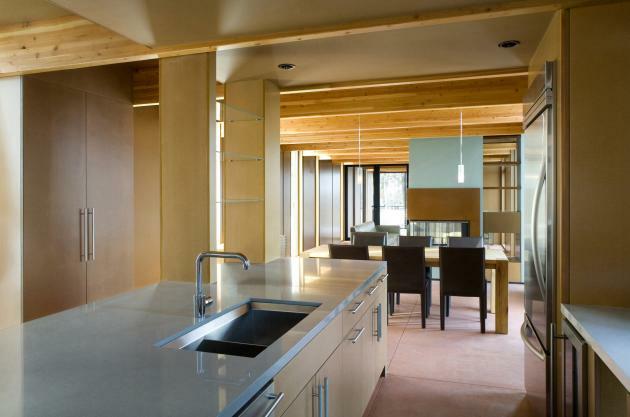 Throughout the house, sustainable materials were specified, such as low-VOC paints, recycled products, native woods, and high-performance glazing. 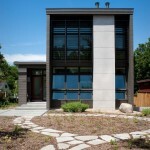 The house was designed to minimize energy consumption. The efficient spatial layout of the program ensured a smaller building volume than expected. The narrow footprint allows daylight to penetrate the building throughout the day, thereby virtually eliminating the need for artificial illumination. Likewise, the narrow building volume facilitates effective cross-ventilation, harvesting the lake’s cool breezes. 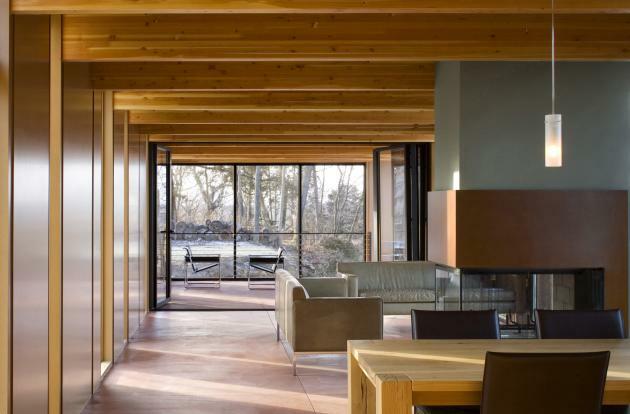 In addition, the screen porch, when combined with the living hall by retracting the foldable glass doors separating the two, functions as a natural air-conditioner for the main level of the house, making mechanical cooling obsolete. 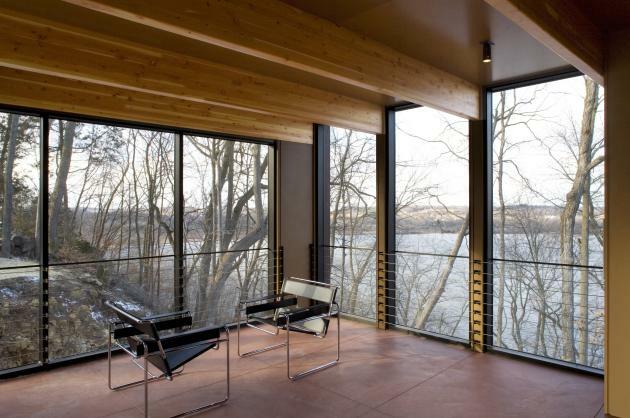 While the stunning site suggested to maximize the amount of glass in the building envelope, the concern for energy efficiency required us to limit the number of windows and instead position them strategically to capture important views into the landscape. High-efficiency insulated low-e glazing allowed us to achieve a high R-value without detrimental effects on the windows’ transparency. The building envelope is wrapped in high-performance expanding foam insulation with an R-value of 24. 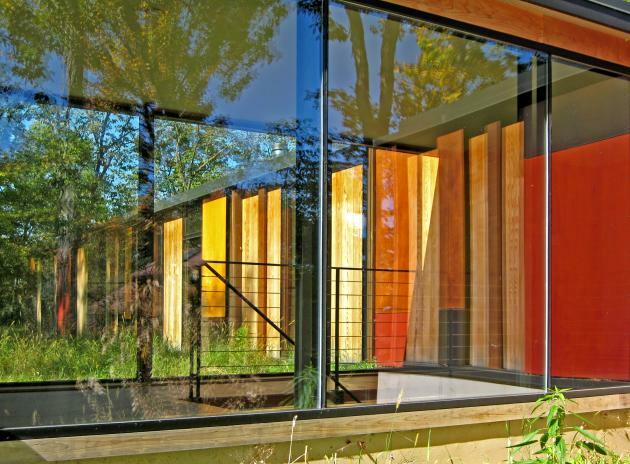 The building is wrapped with a rainscreen system consisting of furring strips and vertical cedar to ensure proper ventilation behind the skin. 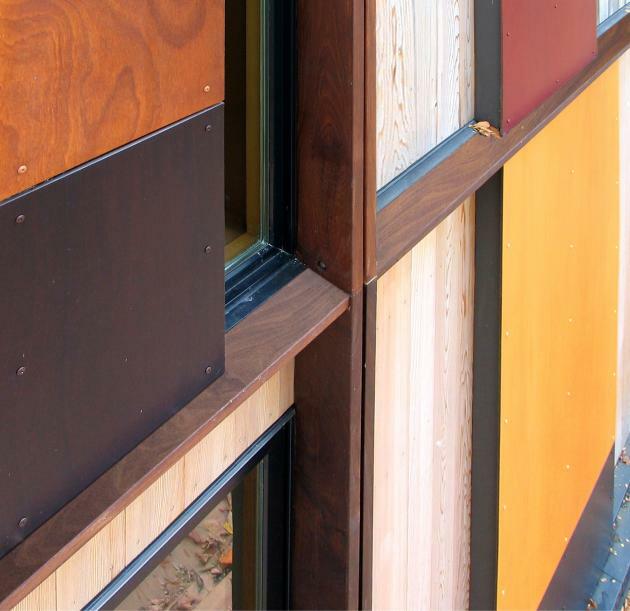 In addition, the Prodema panels, fastened to a vented system of vertical wood furring, effectively reduce the direct solar impact on the building skin by shading portions of the actual building enclosure. 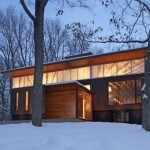 The flat roof proved to be especially effective for Wisconsin’s long winters. We performed several tests that showed that the snow covering the roof throughout several months of the year creates a virtual insulation blanket that increased the roof’s R-value to 54. 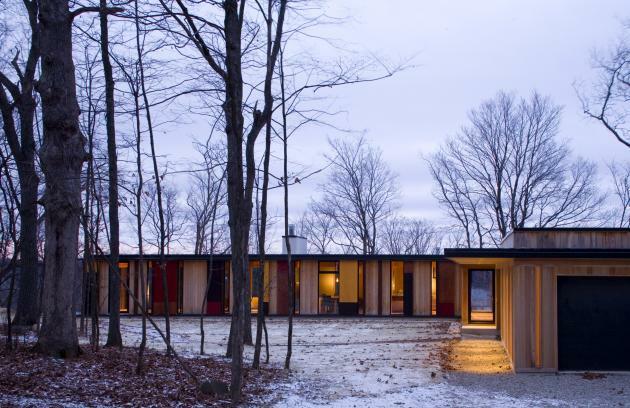 Visit the Johnson Schmaling Architects website – here.